So this blog is about some of my mistakes and failures so far – aka ‘learning opportunities’. Luckily only one is expensively terminal, the others are little setbacks and inconveniences from which plant(s) will recover. Several mistakes have been because of poor cultivation methods. I lost about four raspberry canes through over-watering – the drippers were too close to the bare-rooted canes, I watered too often, and it’s possible I added too much organic matter to the bed. Raspberries are extremely susceptible to root rot and I moved the drippers further away soon as I saw the leaves yellowing and then browning, but it was too late. The surviving plants are going gangbusters, and I’ll replace the failures next winter (not in exactly the same holes, though). 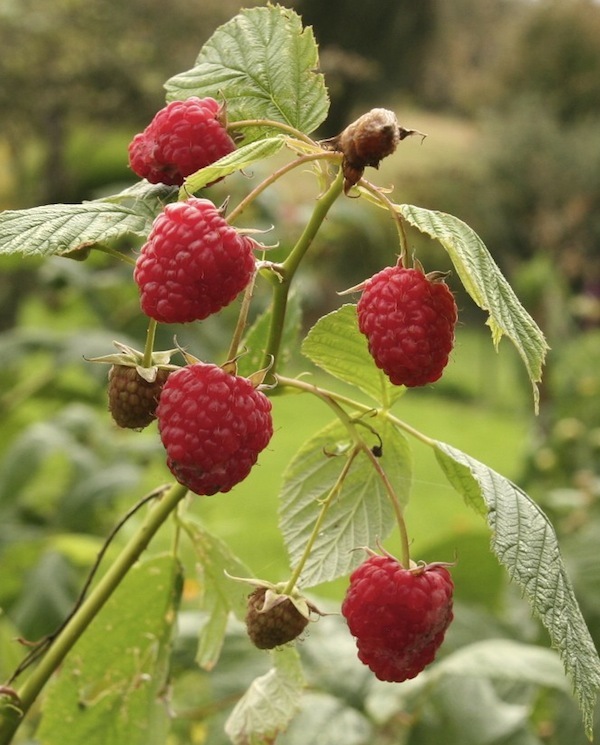 Luckily, unlike trees, bare-rooted raspberries are relatively cheap to buy. Systemic fungicides that protect against root rots are available but I won’t use them in my garden, especially on edible crops. Far better to improve cultivation techniques so the fungus doesn’t establish in the first place! Another cultivation mistake was my red cabbages and cauliflowers. 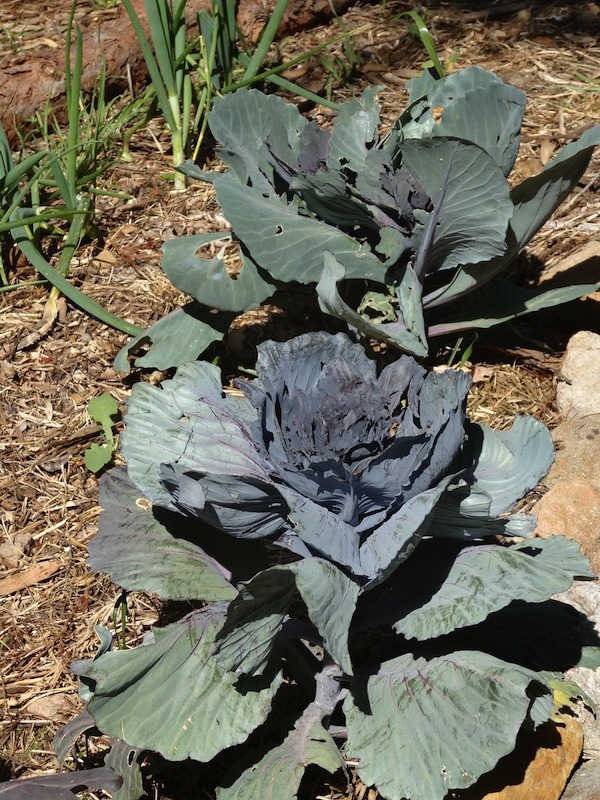 I planted them way too late so the cabbages formed tiny heads, like the gourmet mini ones, while the caulis simply bolted in spring. At least the chickens enjoyed them! My garden has few insect pests – I usually squash them or use soapy water – but this summer I sprayed Yates ‘Success’ on my Nashi, pears and cherry (but not the quince, which is tough enough to survive a Biblical plague of locusts). A neighbour has black cherry aphids and, although they haven’t yet spread to my trees, I’ll keep a close eye out for them and tackle them early if necessary, because once they’re established they make leaves curl up, so contact insecticides like soapy water don’t work, and I won’t use systemic ones. Small grubs infest the growing tips of my Jaboticaba but, other than squashing them, I haven’t sprayed because the tree will almost certainly outgrow them once it’s established next spring. 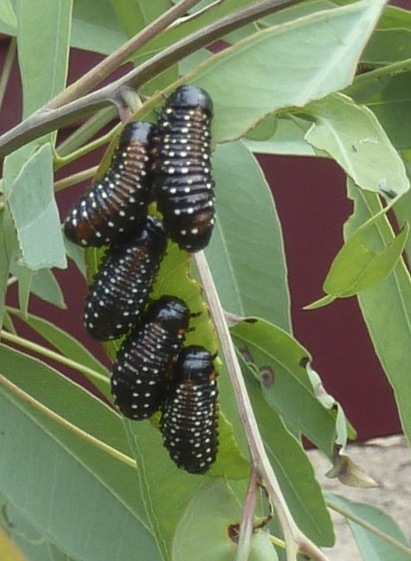 Sawfly larvae are decimating a small eucalypt, which also houses a large and busy population of leaf-cutter beetles. 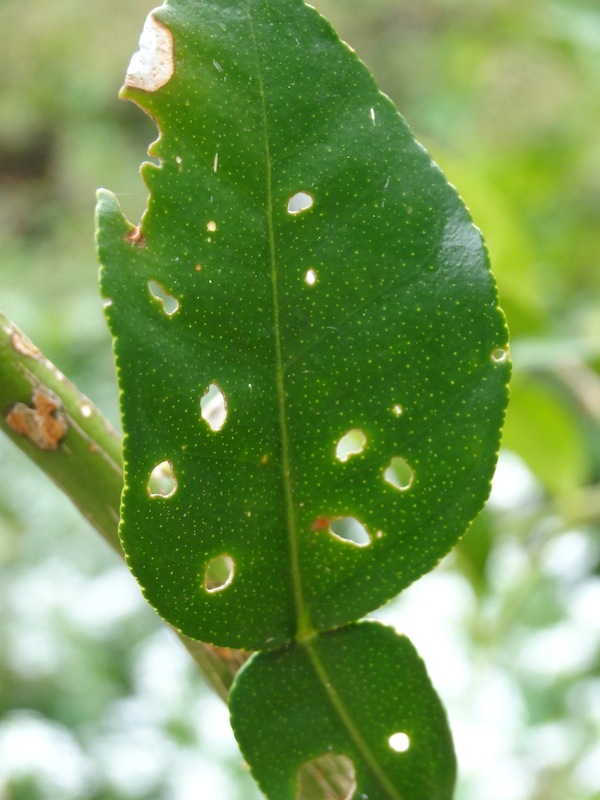 Neither of these pests bother me – indeed, there’s probably an underlying problem with the health of this tree for it to be so burdened with pests – but the third, a gum leaf skeletoniser (Uraba sp.) is more problematic. Not only has it denuded most of the stringybarks, but the hairs of this little caterpillar are highly irritant if you brush against the leaves or if one drops into your collar. The welts they create on my skin last for at least a fortnight and are hideously itchy. Of course, it’s completely ridiculous to spray a native insect that’s a normal part of the ecosystem, but I’m concerned that there seem to be so many of them that they’re defoliating mature trees. It may point to a more widespread environmental problem, as stringybarks throughout the Adelaide Hills are looking stressed and unhappy – perhaps it’s climatic. Either way, I figure that, as these are the caterpillars of moths, one control might be bats, which is why two bat boxes will hopefully help. I’ve also pruned the lower tree branches so I don’t brush against them as I walk past. 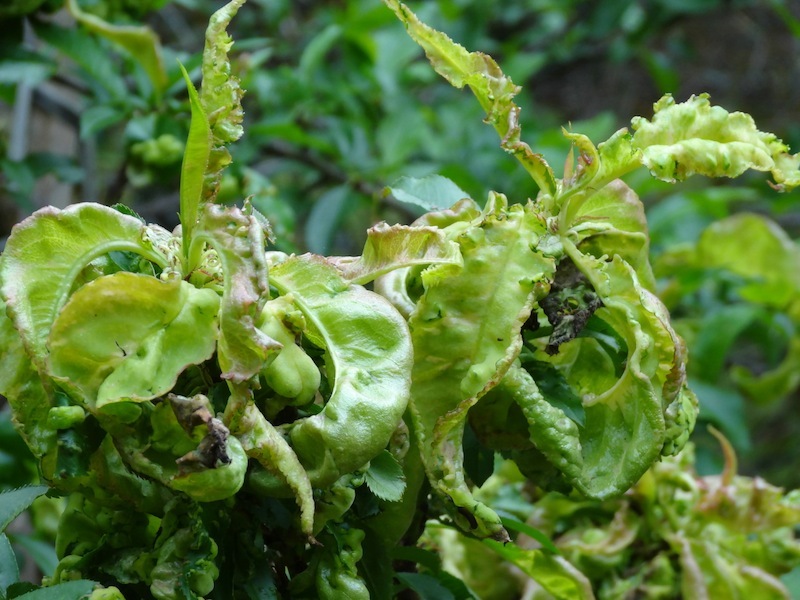 Rather than insect pests, fungal and bacterial diseases are my biggest challenge, because of the less-than-ideal air circulation in the old garden. 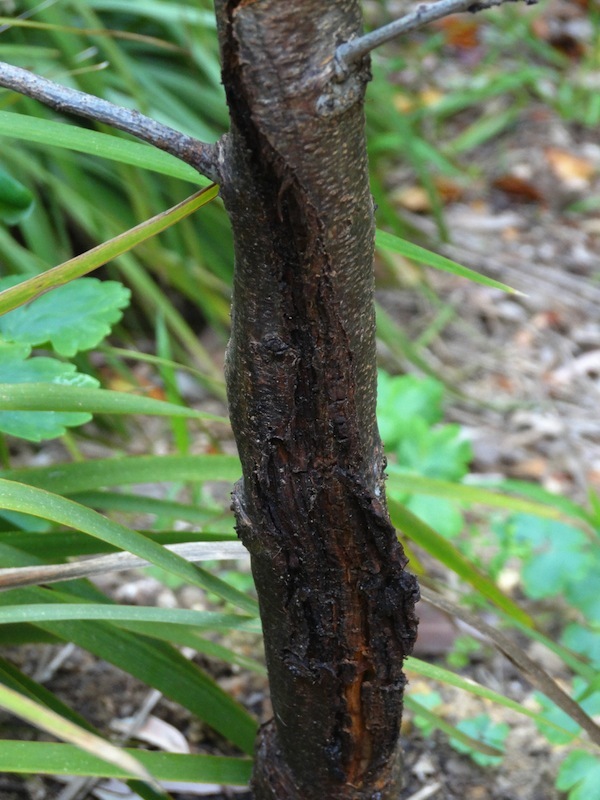 The only terminal case is bacterial canker on the stem of an All-In-One almond on the south side of the house. It was a bit cheeky to try it there at all, because it received little sun while small, though now the branches are taller it’s producing a few nuts. But the bacterial canker, which can be pruned away if it’s on a branch, is untreatable if it’s towards the bottom of the main trunk. The disease will kill the almond sooner rather than later so I really should remove it to reduce the chance of potential infection to any wounds in the adjacent plum. I’ll duo-plant a replacement All-in-One plus a compatible cultivar in the new garden, where the air circulation and sun are more suited. My dwarf Trixzie peach has been in the ground for about five years and last year bore about five kilos of fruit, even though it’s in far from ideal conditions, receiving little sun and air circulation. Not this year, though, and I think I know why. Two winters ago I planted a dwarf Sunset Peach and Dwarf Sunset nectarine either side of my Trixzie and, in spite of being sprayed at bud swell, these two had the worst case of leaf curl I’d ever seen, even in their first spring, when they should have been clean from the garden centre (not a specialist fruit nursery). Later, I saw similarly diseased trees in numerous nurseries – clearly these varieties are particularly susceptible, and I suspect it’s because the buds burst in midwinter or even earlier (earlier than most peaches), so that the new leaves are emerging almost as the old leaves are still falling: a problem in cold, damp, foggy winters like mine. Anyway, in spring 2012, in spite of rigorous spraying with Bordeaux (copper) and later Yates liquid copper four times from part-leaf-fall in autumn, once in winter and again twice before bud swell, the Trixzie also had its worst-ever case of leaf curl. Next year, I’ll try the Yates liquid copper (which wasn’t available for the autumn spray) or perhaps lime sulphur instead, which is recommended in this highly informative article (just reverse the seasons for our southern hemisphere, and adjust for your own microclimate). Spring 2012 was an exceptionally bad season for this fungal disease, and all three trees have now recovered, but this winter I’ll dig them up and put them into pots or plant them into the new area. I’ve been advised that keeping peaches under cover and out of the rain greatly reduces leaf curl, and it’s perfectly feasible to do this with potted dwarf cultivars. 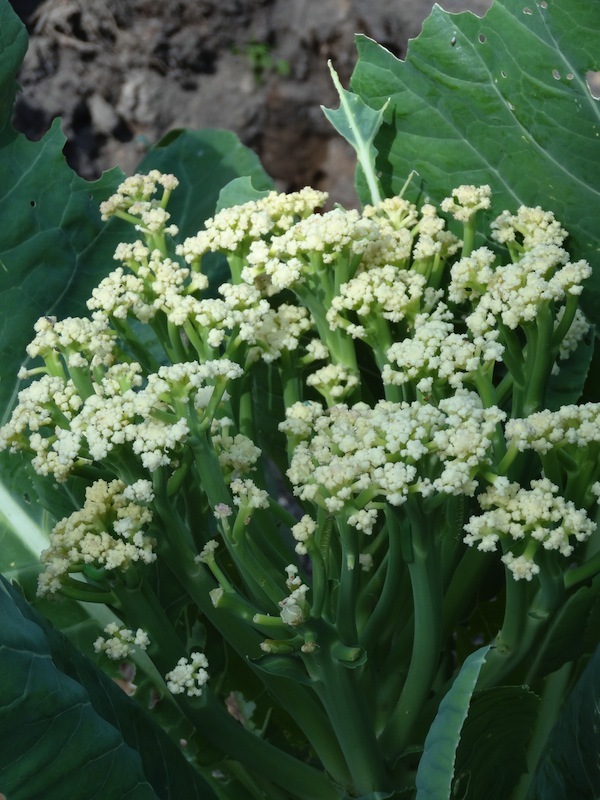 In any case, new dwarf cultivars such as ‘Valley Gold’ are available grafted as one metre standards, which would probably improve air circulation as well. If I were buying dwarf cultivars again, I’d try these later, standard varieties, not least because the Trixzie peach is, in my opinion, rather watery and lacking in flavour. In hindsight, I’d also avoid the ‘Sunset’ varieties in my winters. Another fungal disease affecting two of my Grosse Lisse tomatoes is fusarium wilt, a soil-borne fungus that enters the plant through the roots. Once again it’s possible to spray plants or drench soil, but I’ll simply plant more disease-resistant cultivars such as Mighty Red next year. Tommy Toe tomatoes have never had this disease –or any other fungal disease – in my garden, even in shady spots. They are superb performers and absolutely delicious. The makrut lime looked especially unhappy this spring. 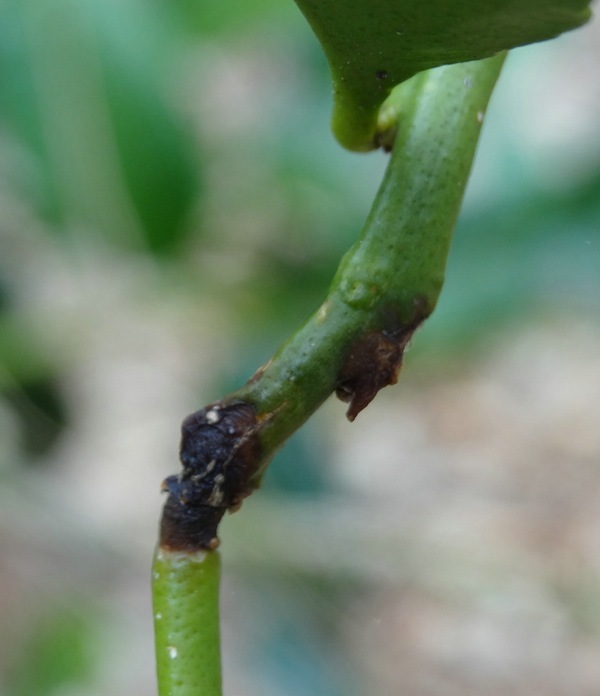 It’s had a mild case of citrus scab which I’d left untreated in the hope that warmer weather would be a cure, but lesions were spreading to stems and killing twigs so it was time to act. I pruned off affected twigs and leaves and sprayed with Yates liquid copper, which has been highly effective. I remember reading somewhere that “the best fertiliser is the gardener’s footsteps”… perhaps the best pest and disease control is the gardener’s eyes. Most diseases can be managed through improved cultivation techniques, or early treatment with organic controls or those with a relatively low toxicity. Unlike in commercial orchards, in home gardens most diseases aren’t devastating because we can replant next year, or tolerate a reduced crop, or spend time on a single tree rather than hundreds. And we’re gardeners, not brain surgeons, so I reckon that a few mistakes and mishaps are a perfectly acceptable part of our profession! Those leaf curl photos need to be in a sealed section. They’ve put me off my lunch! Yes, the fire ash is an excellent idea, thank you!. I’ve read about it but wasn’t sure of its efficacy, but I have a slow combustion heater so it’s in plentiful supply and worth a try next season. I don’t use it in the garden as it’s so very alkaline, but a dusting won’t make any difference. And Catherine, re the appearance of the trees: the Sunset cultivars look particularly horrendous with the disease. I saw an entire row in a nursery for sale and was amazed they hadn’t been removed and grown somewhere hidden until they recovered in summer, because certainly no one would buy them the way they looked in spring! This year I have a new pest problem. Caterpillars completely defoliating the echium. They are about 25mm long, greyish with a pale yellowish stripe down the back and slightly hairy. No idea what they might develop into. Any ideas? The echium were getting woody after 5 years but now will definitely have to go. Pity, as full of nesting sites for the New holland Honeyeaters. I don’t know what the caterpillars are, but Dipel (Bacillus thurugiensis) is an organic, highly targeted control that is extremely effective against all caterpillars (and ONLY caterpillars). Spray the leaves of your plant. 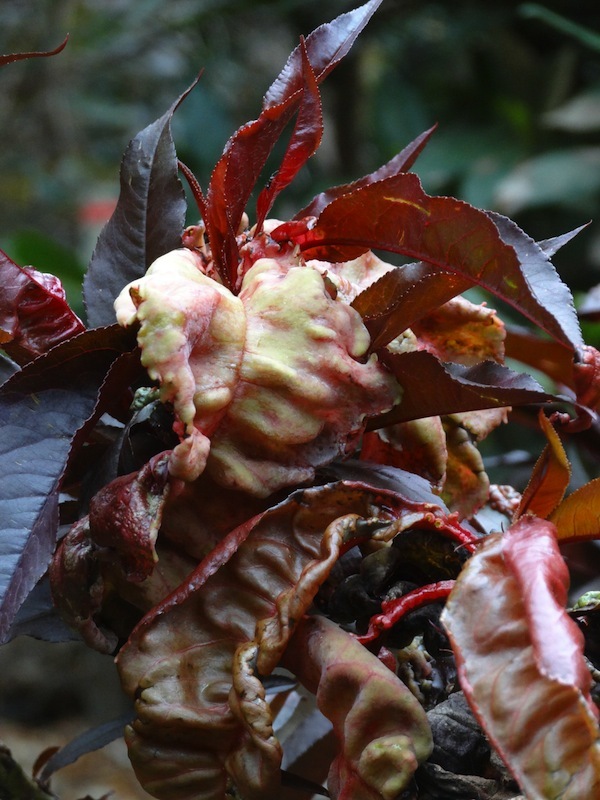 How can you identify Fusarium Wilt and what plants will it affect? I had a pandorea vine die from what I think may be fusarium wilt. I saw small white pustules an the stem close to the soil, but by the time I realised the plant had a fungus, not heat stress it was far too late to save. I am not sure if I can put in a replacement just there now.